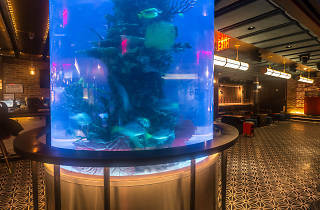 Midtown might be a your new go-to for nightlife thanks to a recently-opened, game-packed bar named FISHBOWL. 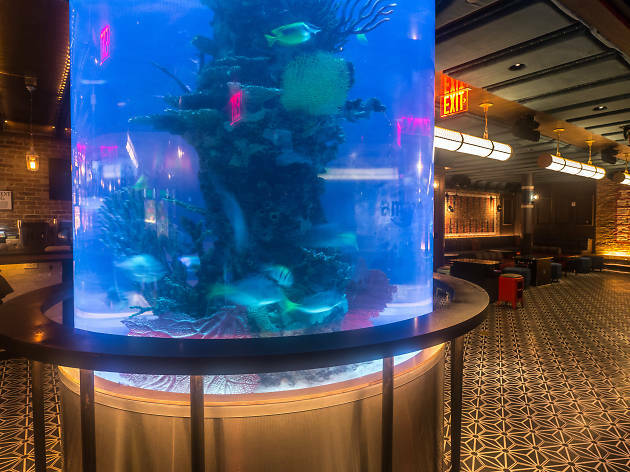 Descend the spiral staircase of the Dream Midtown hotel and you’ll enter a veritable adult playground, complete with two mini bowling alleys, arcade games, Skee-ball machines and a namesake two-story aquarium teeming with exotic fish. The 2,500-square-foot weekend lounge from the TAO Group has plenty of room for other distractions, with a private photo booth and a stage fit for karaoke, live music and rotating DJs. Created by TAO beverage director Drew Sweeney, the cocktail menu at the 20-foot, zinc-capped bar riffs on fun-loving classics.